Ms. Koh also continues critically acclaimed series from past seasons, including Shared Madness, comprising short works for solo violin that explore virtuosity in the 21st century, written for the project by more than 30 of today’s most celebrated composers; and Bach and Beyond, a recital series that traces the history of the solo violin repertoire from Bach’s Six Sonatas and Partitas to 20th- and 21st-century composers. In addition to experiencing Shared Madness in the concert hall, listeners are also able to hear recordings of the premiere performances and interviews between Ms. Koh and the composers via the Shared Madness radio show, which originally aired on WQXR’s Q2 Music during the summer of 2017 and remains available on demand at q2music.org/sharedmadness. Ms. Koh and her frequent recital partner Shai Wosner continue Bridge to Beethoven, which pairs Beethoven’s violin sonatas with new and recent works inspired by them to explore the composer’s impact and significance on a diverse group of musicians; and she performs with the Variation String Trio—of which she is a founding member—and pianist Orion Weiss, in composer Nina C. Young’s piano quartet Spero Lucem and works by Schubert, Beethoven, and Brahms presented by the People’s Symphony in New York City. 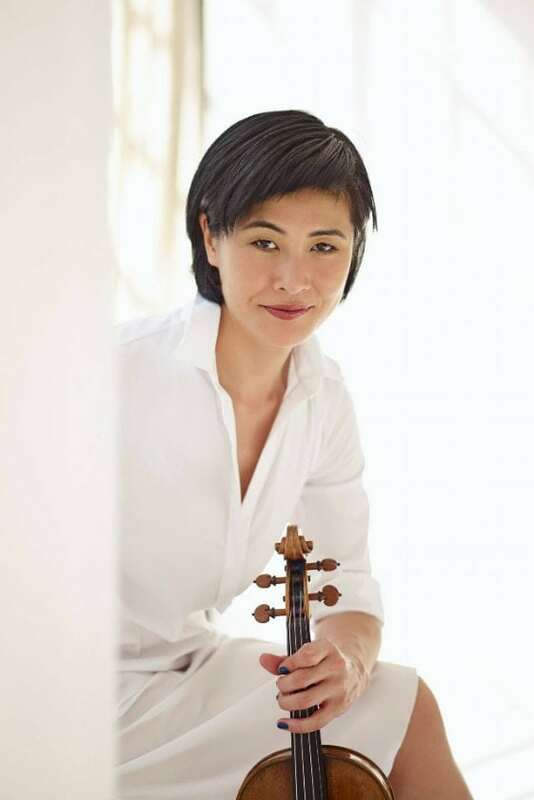 She also performs a broad range of concertos that reflects the breadth of her musical interests, including Barber’s Violin Concerto with the Marin Symphony Orchestra and Oklahoma City Philharmonic; Bernstein’s Serenade with the Fresno Philharmonic; Unsuk Chin’s Violin Concerto with the Melbourne Symphony; Anna Clyne’s Rest These Hands with the Orchestre de Chambre de Lausanne; Lutoslawski’s Chain 2 with the Los Angeles Chamber Orchestra; Kaija Saariaho’s Graal théâtre with the Galicia Symphony Orchestra; Esa-Pekka Salonen’s Violin Concerto with the Nashville and Tampere Symphony Orchestras; Sibelius’ Violin Concerto with the Columbus and Williamsburg Symphony Orchestras; Szymanowski’s Second Violin Concerto with the Milwaukee Symphony Orchestra; and Charles Wuorinen’s Spin5 with Ensemble Signal. Ms. Koh is the Artistic Director of arco collaborative, an artist-driven nonprofit that fosters a better understanding of our world through a musical dialogue inspired by ideas and the communities around us. The organization supports artistic collaborations and commissions, transforming the creative process by engaging with specific ideas and perspectives, investing in the future by cultivating artist-citizens in partnership with educational organizations. A committed educator, she has won high praise for her performances in classrooms around the country under her innovative “Music Messenger” outreach program. Ms. Koh is a member of the Board of Directors of the National Foundation for the Advancement for the Arts, a scholarship program for high school students in the arts. Born in Chicago of Korean parents, Ms. Koh began playing the violin by chance, choosing the instrument in a Suzuki-method program only because spaces for cello and piano had been filled. She made her debut with the Chicago Symphony Orchestra at age 11. Ms. Koh is Musical America’s 2016 Instrumentalist of the Year, a winner of the Concert Artists Guild Competition, and a recipient of an Avery Fisher Career Grant. She has a Bachelor of Arts degree in English literature from Oberlin College and studied at the Curtis Institute, where she worked extensively with Jaime Laredo and Felix Galimir.